Social video app Musical.ly has been updated to version 6.0.1 today, bringing a few notable additions like a refresh to the overall design of the app, a new section that suggests videos users might like to watch, and updates to profile pages (via Variety). Musical.ly, which launched in 2014, rose in popularity thanks to its focus on user-created lip-sync videos. The app allows anyone who downloads it to pick from a library of songs -- now sourced through Apple Music -- then record, edit, and share a short video to the app, and to other social media sites. 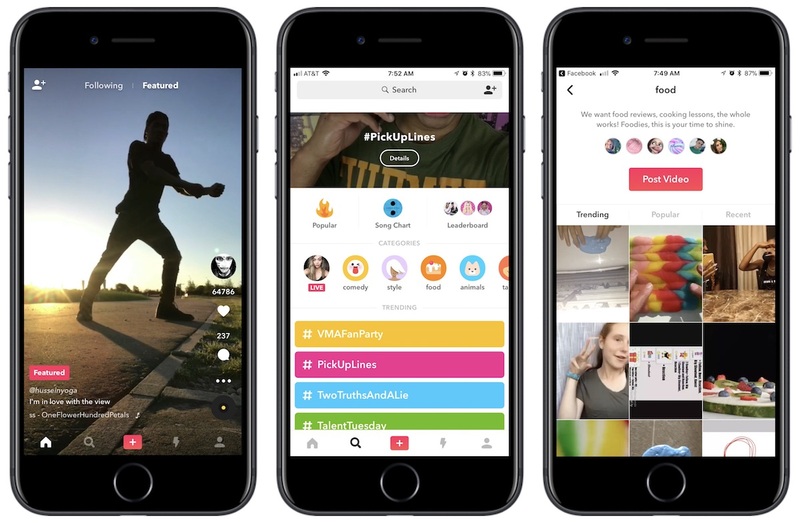 That core concept remains, and users can now upload a profile video that lasts about six seconds to represent themselves when others visit their profile on Musical.ly. The app has also added Twitter as a site where users can share their clips, coming in addition to YouTube and Instagram. Musical.ly is also host to a large collection of videos that its 215 million users can browse and watch, spanning genres like comedy, beauty, fashion, sports, vlogs, food, and animals. Original short-form videos have also been created through partnerships with NBCUniversal, Hearst, and Viacom. This expansion of its video platform side has led to the new video curating feature, called "similar musical.lys" in the app's new update. The changes are an effort to expand the app's user base beyond its teenage-focused demographic, according to Musical.ly president Alex Hofmann, with the video recommendations aimed at new users who might download the app to watch videos, but not have had much use for Musical.ly's other social and video creation features. The No. 1 goal of the new app design is to make “a wide range of content more accessible,” Hofmann said. The new “similar musical.lys” section recommends videos that are similar to videos you’ve watched using an algorithm that incorporates several factors, including a computer-vision system that tries to determine what a video is about. Earlier this year, Apple partnered with Musical.ly to provide Apple Music content as song snippet options within Musical.ly, and in exchange the company agreed to promote Apple Music within its app. The deal allowed Apple Music subscribers to listen to full songs directly within Musical.ly, and also expanded the number of countries where Musical.ly is available from 30 to 120. Musical.ly is available to download from the iOS App Store for free [Direct Link], as well as on the Google Play Store. Wondering how many MacRumors readers use Musical.ly, however under the target audience (younger girls) this app is massive right now! Both my daughters love this app. For the life of me, I don't understand why.